Visitors on a chairlift November 29, 2008 at Winter Park, CO. 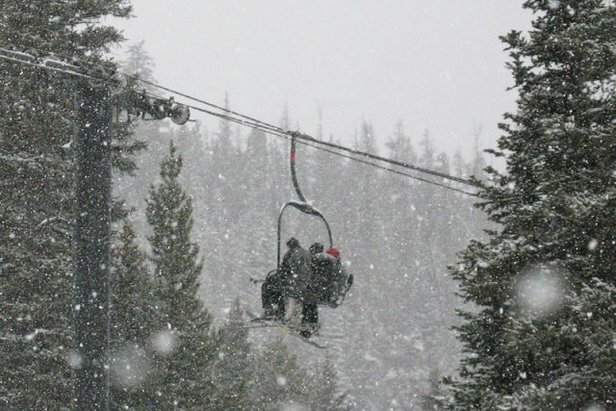 If you've ever been on a chairlift when warmer temperatures call for rain, but instead noticed snowflakes soaking into your coat, this question applies to you: Can it snow when temperatures are above freezing? 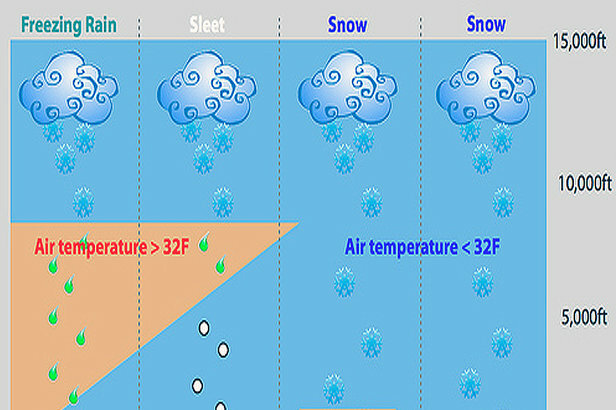 In most cases snow temperature are cold at cloud level, causing the precipitation to start out as snow. If the air temperature is colder than freezing all the way from the cloud to the ground then the snow flakes retain their flakiness and fall as snow. However, in certain situations the air between the cloud and the ground is not always below freezing. This actually happens more frequently along the east coast of the U.S.; When big storms move south to north along the coastline (Nor' Easters), the flow around the storm pulls in air from the Atlantic Ocean. This is good because oceanic air is very moist and can produce lots of snow. This is also bad at times, though, because the same oceanic air is also warm. If the air is warmer than freezing, the snowflakes that fall from the cloud will hit the warm air on their way to the ground and melt into a rain drop. That's not the end of the story, though. As the raindrop falls, it might encounter air that is once again colder than freezing. Since colder air is heavier than warmer air, sometimes it can ‘hang out' very close to the ground and refuse to move despite the best efforts of the warm air trying to push it out of the way. So back to our example, the snowflake that melted into a raindrop would hit this colder air near the ground. If the cold air is thick enough and extends from the ground up a few thousand feet, the raindrop will have enough time to melt back into a solid ball of ice, which is called sleet. If the cold air is just near the ground and only extends a few hundred feet above the ground, the rain drop won't spent enough time in the cold air to freeze back into sleet but it will freeze when it hits a cold surface on the ground (power line, grass, road, etc). Temperature fluctuations and elevation changes are factors in snowflake formation. With that bit of background aside, let's tackle your question head on. If the entire atmosphere is below freezing, the snowflake will fall as a snowflake all the way toward the ground. If the temperature at the ground is right around or just above freezing, the snowflake might not have enough time to melt as it falls since it's only spending a short time in the warmer air before it hits the ground. So yes, as the graphic shows in the column that's second from the right, snow can fall all the way to the ground even when temperatures are above freezing at the surface. One last cool fact is that if it's just starting to snow, the temperature can actually cool a few degrees due to evaporation. If snowflakes fall into drier air, some of the flakes will evaporate and this process actually cools the air. 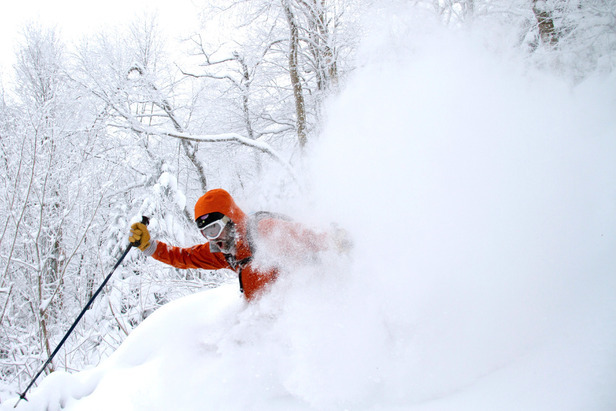 During the next snowstorm, keep an eye on the temperature when the first flakes begin to fly. If the temperature is just above freezing when you catch sight of the first flakes, check back just a few minutes later. Chances are the temperature fell a few degrees because of evaporation and hopefully this gives you a better shot of having that snow accumulate into a meaningful powder day!